A parent's discovery of a class project involving malicious, violent images of President Obama is causing controversy in a Louisiana town, according to the Times-Picayune. 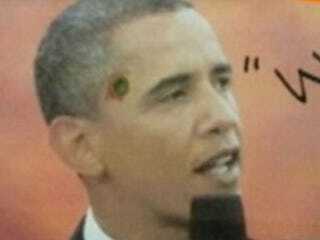 The images, which included one of President Obama with a bullet hole in his head, were posted on the school's walls. The superintendent at Boyet Junior High School in Slidell refused to speak publicly about the controversy but released a statement. "The St. Tammany Parish public school system takes matters such as this very seriously," Trey Folse told the Times-Picayune. "The school system became aware of this situation Friday afternoon and immediately started an investigation into this matter. The investigation will include interviews with students, parents, teachers and administrators. "The appropriate disciplinary action will be taken as soon as all of the facts are in and legal requirements have been met." The local NAACP's branch president, James Davis, said, "If you are a professional teacher, if you have a problem with a political figure or anybody, it's not supposed to go with your job," Davis said. "You're supposed to be a professional, and you are a teacher. We're putting our kids in your hands for six or seven hours per day," he continued. "Not only black kids, but white kids, too, are going to look up at that wall. That doesn't say too much about the people we put there to take care of our kids. It really is [scary] to see that."